Objectives: To evaluate the incidence of active bleeding complications following transplant and the efficacy of interventional radiologic management. 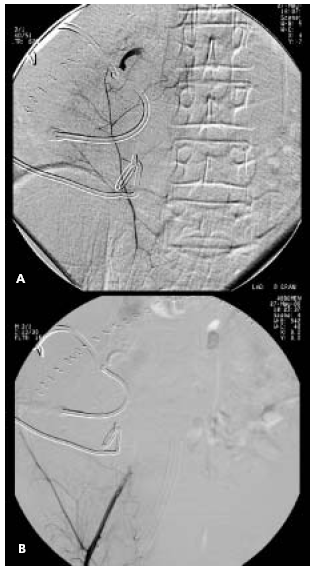 Materials and Methods: Between June 2000 and February 2007, 14 liver transplant patients with active bleeding were treated via endovascular techniques (coils, glue, or graft-covered stents). Active bleeding was spontaneous in 6 patients through the inferior epigastric artery (n=1), the inferior phrenic artery (n=1), the superior mesenteric artery (n=2), the internal mammary artery (n=1), and the hepatic artery (n=1). In 8 patients, active bleeding was due to transhepatic biliary or endovascular interventions. Hemobilia (n=2) due to pseudoaneurysm formation after transhepatic biliary interventions was embolized with coils. 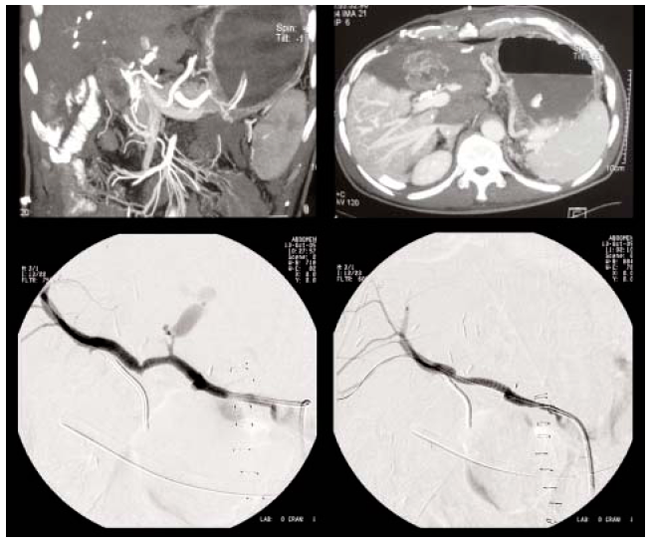 Hepatic artery rupture was observed in 6 patients during endovascular interventions performed on hepatic artery stenosis or thrombosis that had been treated with graft-covered stents. Technical success, clinical improvement, and complications were documented. Results: Active bleeding was stopped by endovascular intervention in 13 of 14 patients. Embolizations with coils or glue were successful. In 1 patient with hepatic artery bleeding, the graft-covered stent failed to seal the rupture site, and this patient underwent reoperation. Conclusion: Arterial bleeding complications after liver transplant during the early and late postoperative period, due either to spontaneous active bleeding or to percutaneous or endovascular interventions, can be successfully managed with interventional radiologic techniques. Liver transplant is a successful treatment for patients with end-stage liver cirrhosis and acute liver failure. Improvements in immunosuppression, perioperative management, and surgical techniques have led to survival rates of more than 90% at 1 year and 70% to 80% at 10 years . However, postoperative complications that range from minor to severe may occur. Postoperative hemorrhage is a frequent complication after liver transplant. The time frame of its occurrence can vary from immediately after the surgery to months after transplant. Approximately 10% to 15% of liver-transplanted patients require reoperation to control postoperative hemorrhage [2, 3]. The most important risk factor for developing early postoperative hemorrhage is the seriously compromised preoperative patient with severe coagulopathy and thrombocytopenia. Causes for early and late postoperative hemorrhage include a compromised preoperative patient condition with serious coagulopathy and thrombocytopenia, initial poor graft function, initial graft nonfunction, violation and laceration of the liver surface, anastomotic leak, heparin-induced, interventions including liver biopsy and percutaneous biliary or endovascular procedures, mycotic aneurysm, and hepatic artery stenosis and thrombosis . Although the incidence and the mortality rate of arterial bleeding after liver transplant have not been precisely determined, it has been reported to cause death . To our knowledge, there has been little published data about posttransplant hemorrhage, its diagnosis with angiography, and subsequent treatment using endovascular techniques. Most cases of arterial bleeding following liver transplant have been treated primarily by repeat surgery [4, 5]. During the last several years at our institution, endovascular treatment has been the first step in controlling presumed posttransplant arterial bleeding. The aims of this retrospective study were to analyze the etiology of arterial bleeding foci in liver transplant patients and to evaluate the efficacy of endovascular treatment. 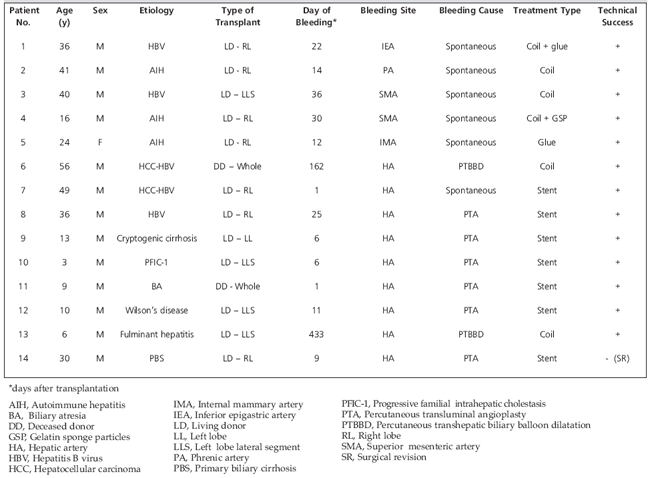 Between June 2000 and February 2007, 14 liver transplant patients (13 men, 1 woman; mean age, 26 years; age range, 3-56 years) with active bleeding were treated with endovascular techniques (coils, glue, gelatin sponge particles, or graft-covered stents). The underlying causes of hepatic failure and liver transplant in these patients were hepatitis-B–related liver cirrhosis with or without hepatocellular carcinoma (n=5), autoimmune hepatitis (n=3), biliary atresia (n=1), fatal fulminant hepatitis due to Wilson’s disease (n=1), progressive familial intrahepatic cholestasis (n=1), cryptogenic cirrhosis (n=1), non-A non-E fulminant hepatitis (n=1), and primary biliary cirrhosis (n=1). The grafts involved in the living-donor liver transplants included the right lobe (n=7), the left lateral segment (n=5), and the whole liver (n=2). An overview of the patient cohort and baseline characteristics are detailed in Table 1. Active bleeding was spontaneous in 6 patients through the inferior epigastric artery (n=1), the internal mammary artery (n=1) (Figure 1), the inferior phrenic artery (n=1) (Figure 2), the superior mesenteric artery (n=2), and the hepatic artery (n=1) (Figure 3). Provisional identification of the bleeding arteries was made based on the patient’s symptoms or signs, red blood cell scans, and the radiologic findings of ultrasound and multidetector computerized tomography angiograms. In 2 patients, active bleeding occurred due to transhepatic biliary interventions. These patients underwent percutaneous conventional and cutting balloon dilatation several times because of resistant biliary strictures during the late postoperative period. Hemobilia (n=2) due to pseudoaneurysm formation after transhepatic biliary interventions was embolized with coils. Using the right or left common femoral artery, a 5-Fr or a 6-Fr vascular sheath was introduced using the Seldinger technique. Catheters were used based on the attending interventional radiologist’s preference. All angiograms were obtained using digital subtraction angiography. Once the bleeding site had been identified, superselective catheterization was performed with a 3-Fr microcatheter (Fast Tracker, Target Therapeutics, Fremont, CA, USA; or Renegade HI-FLO, Boston Scientific, Natick, MA, USA) inserted coaxially through the guiding angiographic catheter. A steerable 0.016-inch guide wire (Glidewire, Terumo, Tokyo, Japan) was used coaxially through the microcatheter to direct its positioning in the small distal branch. Attempts were made to position the catheter just proximal to the bleeding site, allowing for superselective arteriography and embolization. Embolizations in 6 patients were performed using microcoils (complex, helical-fibered platinum coil; Boston Scientific) ranging in size from 2 x 20 mm to 3 x 30 mm. In 2 patients, in addition to the microcoils, a secondary embolic agent consisting of gelatin sponge particles (Gelfoam, Upjohn, Kalamazoo, MI, USA) (n=1) and glue (N-butyl cyanoacrylate, histoacryl, Braun, Melsungen, Germany) (n=1) was used. In 1 patient, only glue was used for embolization. Embolization was performed until no further arterial extravasation was seen. Technical success was defined as cessation of bleeding as demonstrated on angiography. Clinical success was defined as cessation of bleeding without further surgical or endoscopic intervention. In 6 patients, active bleeding occurred owing to hepatic artery rupture at the anastomosis site during percutaneous transluminal angioplasty for hepatic artery stenosis or thrombosis during the early postoperative period. All of these patients been treated with fully polytetrafluoroethylene (PTFE)-covered coronary stents, ranging in size from 3 x 16 mm to 3.5 mm x 27 mm (Jostent GraftMaster; Abbott Vascular Devices, Redwood City, CA, USA). After placement of the vascular-covered stent graft, bleeding at the rupture site completely resolved, and hepatic arterial flow was preserved. In 13 (92%) of 14 patients, active bleeding was stopped by endovascular interventional techniques. All procedures were carried out without serious complications. Different bleeding foci were treated by transcatheter arterial embolizations with coils, glue, or gelatin sponge particles in each session of arteriography conducted for each patient. Control selective angiographic images did not demonstrate recurrent bleeding at the same or any other bleeding foci. In 5 of 6 patients who had been treated with fully PTFE-covered coronary stents, all stent-grafts were positioned in the intended position with immediate cessation of bleeding and initial preservation of satisfactory blood flow. In 1 patient, the graft-covered stent did not seal the rupture site, and this patient underwent surgical revision. Arterial bleeding after liver transplant is not confined to surgical causes. Surgical bleeding is one of the most common causes of bleeding after liver transplant; however, spontaneous or iatrogenic bleeding (ie, surgical bleeding) also is common, as was the case in our retrospective study. Until graft functioning normalizes, coagulopathy after liver transplant is inevitable for a certain time in most liver transplant recipients. The risk of spontaneous and iatrogenic bleeding is also high during the early postoperative period . Thus, clinicians should make a particular effort to prevent iatrogenic bleeding during percutaneous procedures such as liver biopsies and endovascular or biliary interventions. In our study, all spontaneous arterial bleeding occurred during the early postoperative period, ranging between 1 and 36 days after transplant. In our patients, the most important risk factor for developing early spontaneous postoperative hemorrhage may have been compromised preoperative patient condition with serious coagulopathy and thrombocytopenia. Also, patients with poor initial graft function, in whom the synthesis of coagulation factors is insufficient, are at risk for postoperative hemorrhage. In fact, in our study, bleeding from the hepatic artery due to transluminal angioplasty was the most common cause of bleeding. Hepatic artery stenosis and hepatic artery thrombosis (HAT) following liver transplant are 2 major causes of graft failure and mortality in liver transplant recipients. Mortality is higher when HAT occurs soon after a liver transplant . Treatments for HAT include surgical thrombectomy, revision of the arterial anastomosis, retransplant, thrombolytic therapy, and transluminal angioplasty. The most effective approach remains controversial . Thrombolytic intervention and transluminal angioplasty have been recommended frequently for many arterial obstructive diseases, especially for acute coronary artery thrombosis. However, owing to the fear of massive bleeding complications, thrombolytic intervention and transluminal angioplasty are not recommended in HAT and hepatic artery stenosis occurring in the early postoperative period . Although the long-term usefulness of PTFE-covered coronary stent-graft placement has not been confirmed, we believe that vascular-covered stent-graft placement may be a useful therapy for hepatic artery rupture due to endovascular interventions after liver transplant in the early postoperative period. Hepatic artery pseudoaneurysm is a rare complication occurring in 1% to 2% of patients after liver transplant or major liver surgery . Conventional treatment for a pseudoaneurysm consists of surgical ligation and vascular reconstruction or coil embolization. In our study, 2 patients had hemobilia that occurred in the late postoperative period due to pseudoaneurysm formation after transhepatic biliary interventions. We believe that pseudoaneurysms occurred owing to wall damage of hepatic artery segments adjacent to the bile ducts, which had been dilated with a cutting balloon. We treated the pseudoaneurysms with coil embolization without stopping normal blood supply to the liver because this arterial supply is crucial not only to the liver parenchyma but to the bile ducts as well. Arterial obstruction or thrombosis frequently results in graft failure and increases the incidence of mortality by as much as 50%. In conclusion, arterial bleeding complications after liver transplant during the early and late postoperative period due either to spontaneous active bleeding or to percutaneous or endovascular interventions can be successfully managed with interventional radiologic techniques. Figure 1. A 26-year-old-woman who had undergone a living-related liver transplant with a right lobe graft. A. Selective right internal mammary artery injection shows contrast extravasation of the medial distal branch. B.	Superselective angiography with microcatheter demonstrates the active bleeding site. C.	Postembolization arteriography after glue injection demonstrates occlusion of the bleeding artery. Figure 2. A 32-year-old man who had undergone a living-related liver transplant with a right lobe graft. A. Selective right inferior epigastric artery injection demonstrating active bleeding at the distal branch. B. Postembolization with glue shows occlusion. Figure 3. A 57-year-old man with a right lobe graft on postoperative day 1. A-B	Multidetector computed tomography images demonstrate active bleeding from the side branch of the hepatic artery. C-D	Hepatic arteriography, before (C) and after (D) stent-graft placement in the hepatic artery; bleeding was stopped and good flow was established.